Three checks drawn on the Banking House of L.H. Hershfield & Bro. 1867-1874, Helena, Montana, with vignette of miner at far left. Very good condition. In the early 1860s, Lewis Hershfield journeyed with a team of oxen from Leavenworth, Kansas to Central City, Colorado. In Colorado, Lewis Hershfield collected 26 wagons full of dry goods. Lewis Hershfield drove this collection of goods through Colorado and Utah and settled in Virginia City, Montana in 1864. Lewis Hershfield found success among the miners of Virginia City. In addition to his dry goods store, he established a bank, storing gold as well as exchanging gold dust for money. 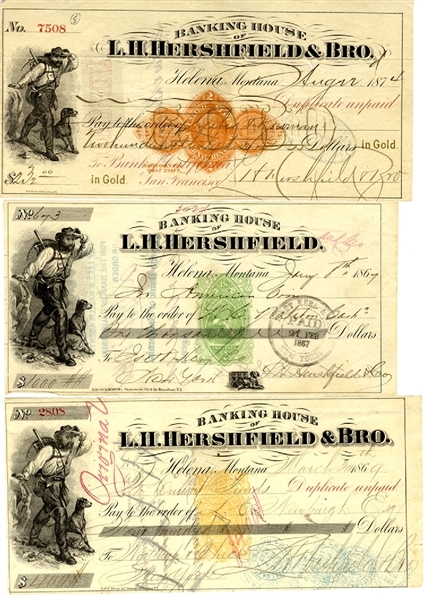 During the 1870s, Lewis Hershfield moved his bank to the mining boom town of Helena, Montana. In 1878, his brother, Aaron Hershfield (1848-1918), joined him in the business, which changed its name to L.H. Hershfield & Brother.